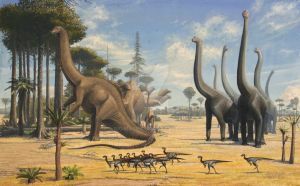 Brachiosaurus herd. This is small file size but try to notice small birdlike dactyle hunting for fish on the small stream in front . Brachiosaurus modeled in Zbrush, rendered in 3ds MAX and comped in photoshop. Background layered from dozen of photos of my own, digital matte painting is the therm used for this technique. Print for private use only. There's no larger version, You're welcome to use this one as your wallpaper..
Wow! This is a sensational image - amazing work! 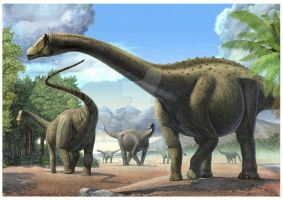 Brachiosaurus is one of my favourite dinosaurs. The scattering flock of pterosaurs really helps to give a sense of the scale scale of these colossal animals. The landscape looks very authentic too - the trees in the background look to me cypress pines (Cupressaceae family) which have a Jurassic fossil record, and the environment of the Morrison formation (one place where these animals lived) was seasonally dry, so the parched-looking water hole is also very accurate. I love this picture - it really does create the illusion that you just went back in a time machine and took a photo! Thanks for posting it. Your comment is very rewarding to me!! I feel as tho I succeeded with the illustration if it touches or inspires at least one person so Thank you! Great detail and fantstic background. 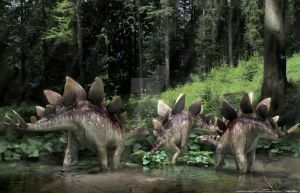 Not to be rude, its really nice, but don't Brachiosaurus have small spikes on its neck? Nicely done...It's neck should be somewhat longer. This is so excellently done i almost thought it was a concept printing for Jurassic Park IV or something. incredibly detailed and amazingly & beautifully done. Amazing sculpting skills you have, sir. Also, the final piece is pretty much 'National Geographic' high standard. Are you making any films? Elephant skin? Are you kidding me? If you could resize your own skin portion from your body to match the size of an elephants skin, it would look pretty much the same except for the color. Espically the Pteranodon which looks like a giant pelican. I really think this is a real places I want to go there and see this Brachiosaurus. odlican rad! vidim da su ptice su sletile na brachiosaurusa, kao neki parasiti ili...? This is by far my favourite piece you have made. Its amazing! Yabba-Dabba-Doo! .... SO WELL done!! Absolutely breathtaking man! Thank you for sharing this. I can almost walk besides them and hear the dactyls streaming by. A very very intensive scene and great use of techniques. Keep Calm and Draw a Dino!